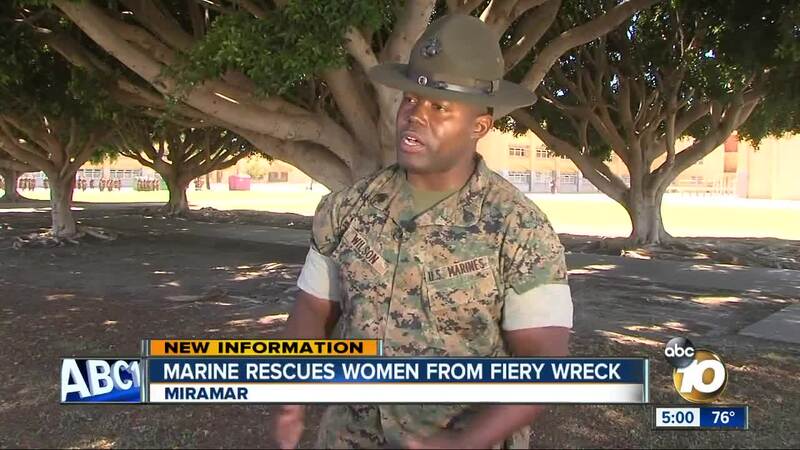 SAN DIEGO — A Marine helped rescue a woman who was injured in a fiery multi-vehicle wreck on in Miramar, California on Tuesday morning. The crash, which involved at least five vehicles, happened shortly after 8 a.m. local time on southbound SR-163 according to California Highway Patrol officials. Marine Sergeant Gary Wilson was going to work when he saw the flames. He said he jumped off his motorcycle and ran to the burning car. Wilson broke through the driver's side window to free a woman trapped inside and pulled her from the car. She had a concussion and blood on her face. “I had my jacket on and didn’t think about it. I just broke the window and pulled her out,” Wilson said. After the first rescue, Wilson went to the second car and pried open the female driver's door to get her to safety. “I was doing my job as a Marine. We’re here to serve the people. Not just during wartime, but all the time," Wilson said. Both women in the chain-reaction crash were taken to the hospital, but both are expected to be OK. No other injuries were reported.